We all know the bewilderment after a great loss that the world just keeps on turning on. That things do not seem to care feels like a huge insult to what has happened. The sun should disappear, the earth should tear apart, buildings break! This happened only once: at Jesus’ crucifixion. That was the exception. Hence the Dutch artist Armando (who needs to be more widely known) coined the term ‘guilty landscape’. Armando declares the landscape guilty, not because it lets atrocities take place, but because it refuses to bear testimony. Whatever happens, it just keeps on growing. The forest is not guilty of resignation, but of erasing the traces, even though it witnessed everything: ‘All these wood edges. All these condemnable trees. You can’t move there for the guilt, tree by tree,’ Armando jotted down in one of his diaries. The Norwegian artist Jonas Dahlberg punishes the landscape for its guilt. Before July 22, 2011 almost nobody knew of the small-island-in-a-lake Utøya. Then Anders Breivik killed 69 young people there. Since that time it is impossible to think of this island without thinking of the 69. This will still be the case in a century. Still the trees did not flinch. Everything kept on growing, imperturbably. Even the birds sang on and on. That’s why Dahlberg now wounds the island. He calls it a ‘memory-wound’. Also the island will have to commemorate what we cannot forget. And in a century, even in 1000 years, the wound will still be visible. Maybe even on the new earth. Also when Jesus was risen, he still had his scars. Why should the earth not keep its scars on judgment day? Dahlberg’s Wounded Landscape is still a plan. Next year, exactly four years after the wounding, the ‘commemoration void’ will be unveiled. A meditative commemoration path will run across the island towards the cut, ending in an observatory where people can read the 69 names on the opposite wall. 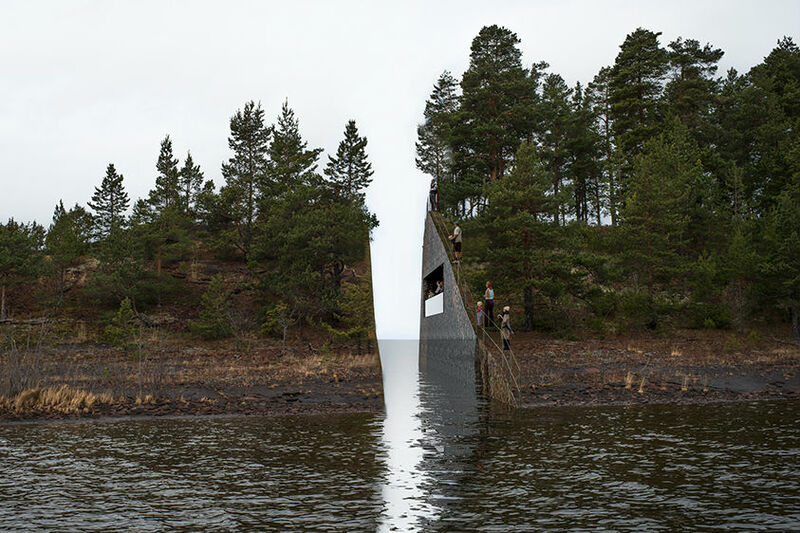 The sand that is taken out of the cut will form a second monument in Oslo, where Breivik killed several people as well with a car bomb. A void/empty space is actually quite mysterious. Without whatever surrounds it, it would be nothing. In the Christian tradition evil has often been compared with a void/empty space (in Latin: privatio boni). That is a bold and audacious vision. It means that evil is nothing without goodness, that it can only steal. That also means that goodness truly leads the way. It is always in the majority. That is the comfort offered by these landscapes that keep on budding and flowering after horrendous events. Their beauty refuses to be subjugated by a Breivik, a Hitler, an ISIS, and always turns out to be stronger. 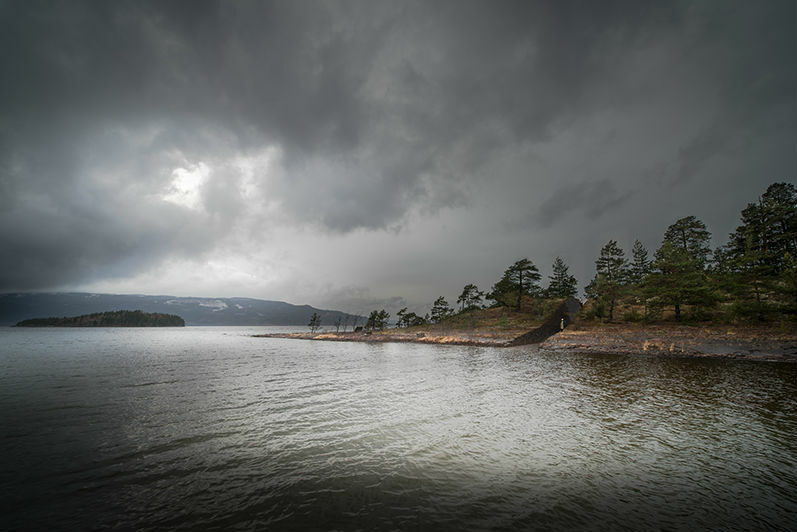 Jonas Dahlberg: Wounded Landscape, 2015, Utøya, Norway. Jonas Dahlberg (b. 1970) lives and works in StockholmSweden. He studied architecture at the TechnicalHigh School from 1993 to 1995 at Lund. From 1995 to 2000 he studied art at MalmöArtAcademy where he received his M.F.A. in 2000. Since 2000 he has developed a series of videos that primarily consist of slow movements through architectural spaces. The videos are created by building miniaturized architectural sets that are filmed through experimental methods. In addition to video and video installation, his practice includes public art works, sculptures, commissions, book projects and photography. Through his installations, video or otherwise, Jonas Dahlberg works with space. Architecture is addressed as a political place that influences how we understand ourselves, and how the body and mind experience the outside world. For more, see www.jonasdahlberg.com. Reinier Sonneveld (b. 1978) creates films and writes (mainly theological) books. He was the youngest writer in the Netherlands to receive the Prize for the Best Christian Book. He is a member of the board of Artway.